When I was visiting my mother in the nursing home this past Monday, I found several “prayer cards” in a drawer of the table by her bed—notes from a group of people at Covenant Presbyterian Church in Jackson (Mississippi)—the church my parents helped establish in the 1950s—who get together every Monday (or so the dates seem to say) to pray for people. I found cards dating back to January of 2015, some opened, others still in sealed envelopes. Mom hasn’t been able to read mail for a couple of years. She no longer understands what it is, and of course she doesn’t recognize the names of the people who send her cards and letters. But the love and prayers behind the cards are such a blessing to me. Yesterday I read through those cards and wrote thank-you notes to several folks whose names I recognized. What a joy to see Jeffie Carter—who taught me in the second grade at Spann Elementary School—amongst them. Jeffie must be in her late 80s or early 90s by now. She was my very favorite teacher of all time. Also amongst the names were Linda and Auburn Lambeth. Auburn was my Sunday School teacher at least one year at Covenant. Dr. Boyd Shaw—the compassionate physician I called upon during the final days and hours of my father’s life when the hospice nurses couldn’t get Dad’s doctor to prescribe more morphine. Ernie Strahan, Richard Coker, and Virginia Brock’s names were also there—other founding members of the church from over fifty years ago. As I read over the names, I thought about the fact that my mother would be one of those people gathering to pray on Mondays, and signing her name to the cards being mailed out, if she could. How tragic that she’s the one in the nursing home instead—no long able to read the cards and remember these people she’s known for so long. 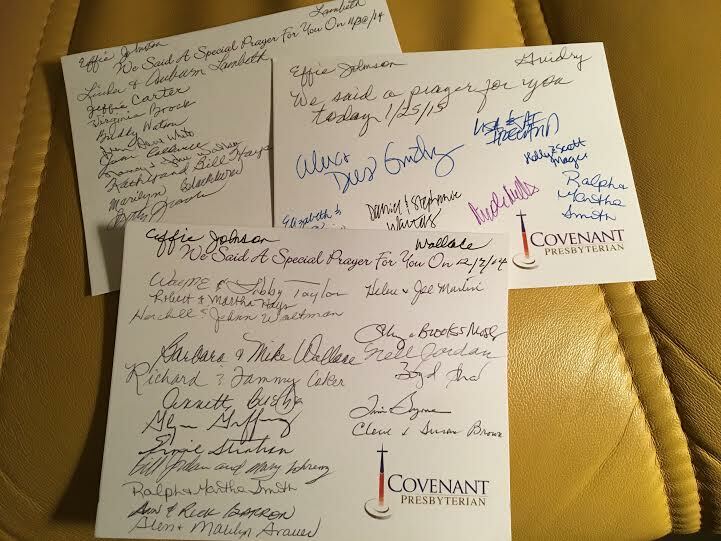 When I wrote my thank you notes to several of these people, I told them that their prayers were like hidden treasures, so valuable and yet unseen by most people. But not God. I believe He hears their prayers, and that somehow—in a mystery—my mother is comforted by them.